Whenever I turn on the news, it seems like there’s more and more violence happening in the world. I always feel so helpless in the face of all of the sadness and suffering going on. What can I do to help? I am one person, living a quiet, middle-aged life in my little corner of this world. I thought about this as I beaded the triangles for this necklace, one by one. As I got into the meditative rhythm of adding one bead at a time, I found myself moving to a deeper place, a silent place, and I started to send out positive thoughts and prayers for healing. On the path of those thoughts and prayers, this necklace was born. I call it Prayers for Peace. 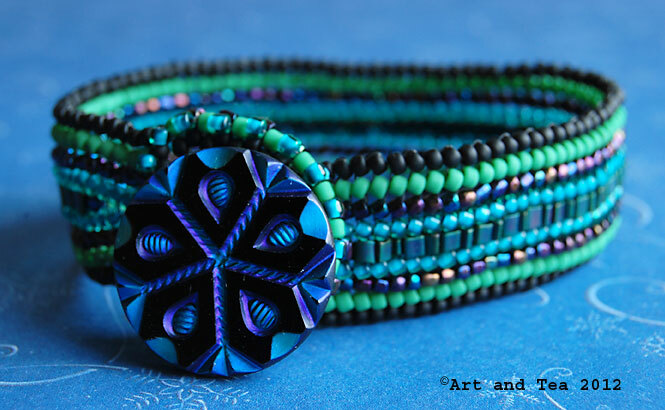 I was inspired to create these beaded triangles when I received my copy of the wonderful Contemporary Geometric Beadwork by the fabulous Kate McKinnon and her beady tribe. I started out with an exploration of colors and patterns. 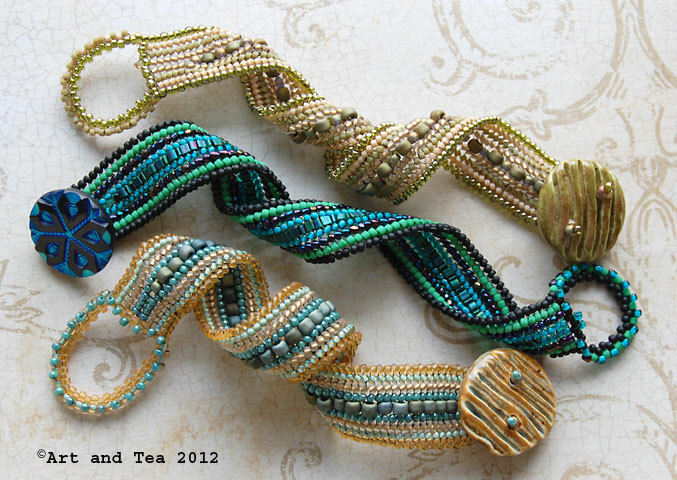 I then moved on to the creation of a more organized beaded piece – a necklace. I chose a warm color and a cool color to represent the energies of light and dark and the healthy balance of these energies. Like yin and yang. The biggest challenge with this piece came after I had beaded all of the triangles. Now how do I connect them together to form a necklace? I thought about this for awhile and had come up with several options when one day I experienced a serendipitous moment whiling creating some headpins with silver wire. How about if I use a headpin as a sort of hinge attachment? And it worked. Most excellent. Using the same headpins, I then created some chain links and a triangle shaped clasp link. I’m really enjoying my foray into the geometric beady world these days. Stay tuned for further adventures as I explore beading a cuff with “horns and wings”. Think Klingon warrior and the colors of tea! Good morning, dear tea friends! The tea that I’m drinking this morning is so smooth that I’m already on my second cup in a matter of minutes. Grown at the Nildiya Valley estate in the Matara District of southernmost Sri Lanka, this black tea is the perfect example of an Orange Pekoe, or OP, tea. Contrary to what the name implies, it is not a flavor but a term used to designate the leaf grade of the tea, in this case, a whole leaf tea. This leaf grading term is typically used in black teas from India and Sri Lanka. You can see the rolled whole leaf clearly in the photo above of the wet leaf. I steeped the leaf for 5 minutes in boiling point (212F) water. This tea is so smooth that I think the steeping time could be pushed another minute or two, especially if you’re adding milk. The fragrance of sweet raisins drifted up from my glass teapot as I poured my first cup. The dark-amber tea liquor flows like silk over my tongue. As the tea cooled, a hint of fruit was revealed along with a light toasty note. Summer is hanging on here in New England with warm, humid weather. I’m enjoying it as much as I can because I always find it challenging to give up those warm, lazy, hazy days. Soon it’s time to sharpen those pencils and get to work! Speaking of getting to work, I just signed up for this online course with the fabulous Susan Lomuto, creator of Daily Art Muse and art curator extraordinaire. Susan will teach us how to create a website to showcase our artwork. With a full-time job and so little free time, I was hesitant at first but then I listened to that small voice inside and took the plunge. This is something I’ve wanted to do for a long time – improve and expand my online presence and even start selling my jewelry again. This past year has been quite challenging personally and has led me on a journey of looking at what is really important in my life. I’ve been working hard on letting go of negative experiences of the past and moving forward with my art. I’m looking forward to discovering what the future holds! It’s that time of year again. The official start of summer, a time we New Englanders cherish and dream about when the frigid winter winds are howling outside. One of my favorite summertime treats is a glass of frosty cold iced tea. So, to kick off this holiday weekend and the start of summer, I’m resurrecting my post on how to prepare iced tea for you all to enjoy. Have a wonderful holiday weekend, dear tea friends! I recently came across this on Donna Downey’s blog, Simply Me. It just resonated with me so deeply that I thought I would share it with you. As I browsed through Donna’s blog, I thought about how this amazing mixed media artist personifies the word sharing. Her posts are filled with tutorials and videos sharing her love and passion for her art with others. Wow. I started making jewelry back in the early 90s. At that time, there was no internet, no bookstores in my small town, no jewelry classes, no artists’ groups. As you can imagine, I knew what I wanted to do but I just didn’t know where to start. So, I traveled to a craft show about 45 minutes from my home, hoping to meet some artists, namely jewelry artists, who could give me some advice on where to start. I had an experience there that I will never forget for as long as I live. I wandered around the show and finally found the table of someone who made jewelry. As I was admiring her work, I asked her how she got started and where she purchased her beads and components. She literally hissed at me, “I worked hard to come by that information and I”m certainly not giving away any of my secrets to you!” I was stunned and left the show in tears, thinking I had done something really wrong. 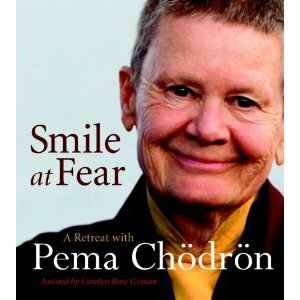 Over the years, I’ve thought about that experience and discovered what a great teaching it’s been to me. In the years to come, whenever I was asked that very same question at a show where I sold my jewelry, I freely shared all of my “secrets”, where I bought my beads and components, often writing down the information about the bead shows I attended every year. Yes, I did have to work hard to obtain all of that information but I wanted to share it with an open heart with as many beginning jewelry artists as I could. It’s amazing how a negative experience like that will stay with you and shape your future. Have you ever had a similar experience? I’m a big Star Trek fan. I mean big time. I watched the original series in the 60s with my parents. Then came the Next Generation in the 80s. Voyager in the 90s. Deep Space Nine in the 90s. Enterprise from 2001-2005. When the J.J. Abrams movie came out 3 years ago, I went on opening night. So, you get the picture. Anyway, they’re always talking about the Spacetime Continuum. You can read the technical definition here but it basically refers to an event as it relates to a point in space and time, with the 3 dimensions of length, width and height (space) and the 1 dimension of time. A moment in time and where it is located. I’ve been reading some interesting theories about the concept of time, in particular, the work of John William Dunne, an Irish aeronautical engineer who conducted some experiments with his precognitive dreams and then wrote a book about it in 1927, An Experiment with Time. Dunne posits that past, present and future are all happening simultaneously. We can only “see” the present time because that is what our human consciousness is meant to see. However, when we are unconscious in a dreamstate, our human consciousness is unrestricted and we are able to traverse all of time. For this Star Trek fan, this is all quite fascinating stuff. As my mind has been mulling over these ideas about time and spacetime, my imagination has been inspired to manifest this bracelet which I have aptly named “Spacetime”. Created in the shape of a watch, the “face” shows a 3-color pattern representing past, present and future instead of a fixed moment in time as a “normal” watch does. 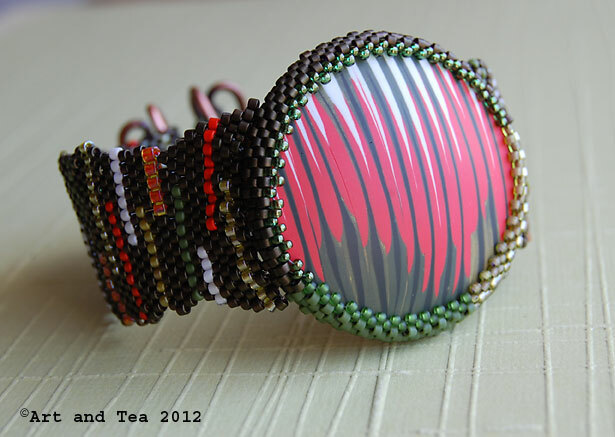 The “face” is a polymer clay lentil bead with a crushed ikat cane pattern. I believe that Donna Kato is the originator of this cane. I learned how to create this cane from a demo at one of my polymer clay guild meetings. If you’re interested in seeing how it’s created, I found this tutorial by Mia Rox. I beaded a bezel around the lentil bead using size 11 and 15 seed beads. The “strap” is brick stitch. I puzzled over what to do for the clasp for several weeks. One evening I happened to pick up my copy of Kate McKinnon’s “The Jewelry Architect” and there it was. Kate calls it the “Ram’s Horn Clasp”. It is positively brilliant! Thank you for your inspiration, Kate. I tweaked mine a bit from the original design. The spiral is a universal symbol found in nature and art and I have always been fascinated with its non-linear shape. Perhaps it also speaks of the abstractness of time? 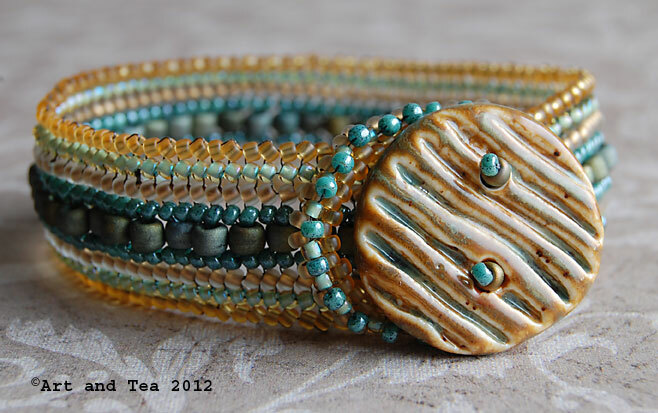 I just love beading these bracelets. They’re a great way to play with color palettes inspired by the different buttons I use for the clasps. 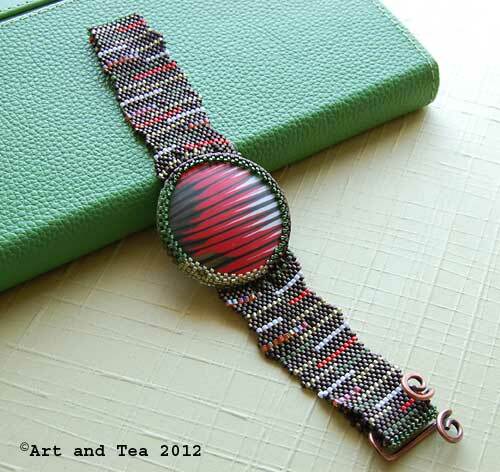 I first wrote about my love affair with these herringbone stitch bracelets here. These wonderful porcelain buttons were created by Maryann Carroll of Artisan Beads Plus. The delicate, muted colors remind me of the awakening spring world outside. This color palette reminds me of sea and sand. I just love the texture on these buttons. Herringbone stitch gets its name from the way the beads sit next to each other in a v-shaped pattern. The beads in my bracelets are woven in 2 at a time except for the single row of larger beads running down the middle of the bracelet. 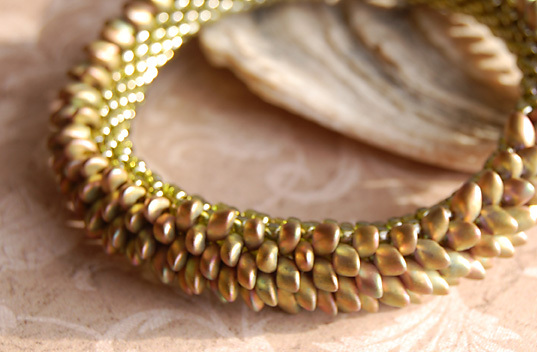 This stitch creates a bead fabric that feels silky and sinuous against the skin. Almost like a second skin. The button and loop clasp make for a super easy on and off that my “getting older” fingers are grateful for. 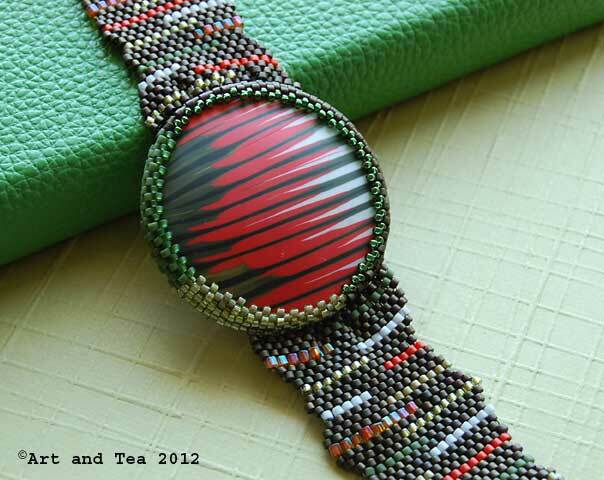 For this bracelet, I chose a vibrant color palette to match this beautiful vintage style button I purchased years ago at a Whole Bead show in Providence, RI. 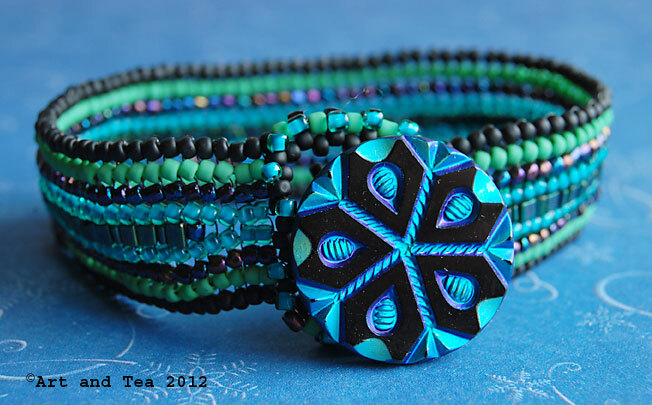 For the center row of larger beads, I chose triangle shaped seed beads that interlock together perfectly. The majority of beads in these bracelets are a size 11. Interestingly enough, I shared my ribbon bracelets last year right before a spring trip out to Michigan and here I am leaving tomorrow for a trip out there. I’ll be sure to visit my favorite bead store in Frankenmuth, Bead Haven, as well as a stop by Munro Crafts in Berkley. Stay tuned for treasure sharing! As always, thanks for stopping by and have a most wonderful week. 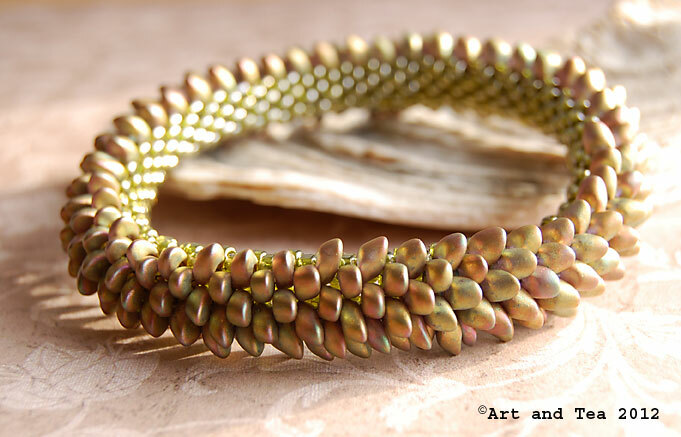 In anticipation of the second season of my beloved Game of Thrones series starting this Sunday, I thought I’d share with you a bangle of “dragon scales” I wove last year. Years ago, when I was just learning all of the different beadweaving techniques, I was a faithful reader of bead magazines. 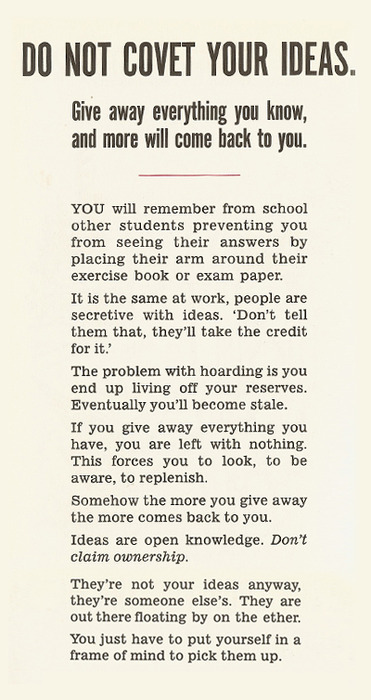 I think that they’re a wonderful resource for learning and inspiration. After awhile though I found myself drawn to create my own designs so I stopped buying the magazines and started following my own voice. A good thing, too, because at that point, the magazines were taking over my studio floor! That said, about a year ago, I was browsing around our local bookstore, cup of Chai tea in hand, when I spied the latest issue of Super Beadwork magazine. 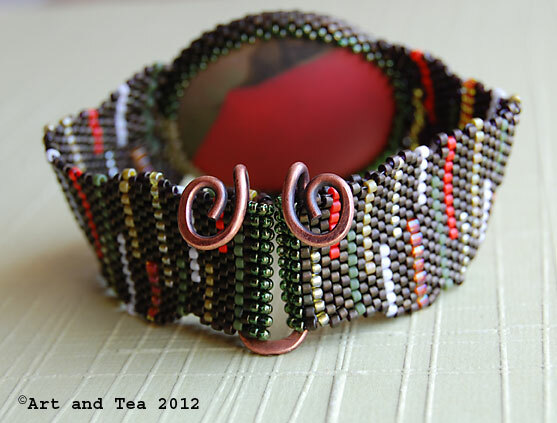 The cover featured this bangle created by Nancy Jones of Tiny Dog Seed Beads in Houston, TX. 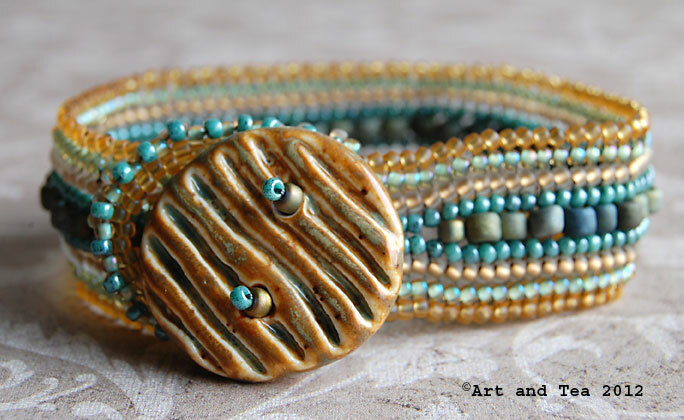 She was using a kind of bead that I had never seen before – a 4x7mm long magatama bead. To me, each individual bead looks like a tiny shoe but when woven side by side like this, they look just like dragon scales. Or what I imagine dragon scales would look like. 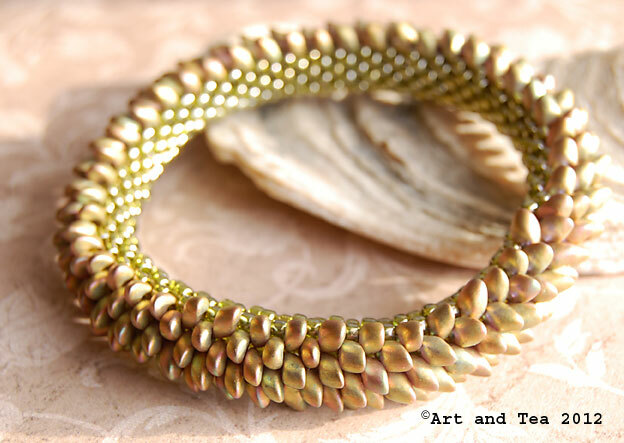 I was quite entranced with the design so I purchased the magazine and went to work creating my own bangle. 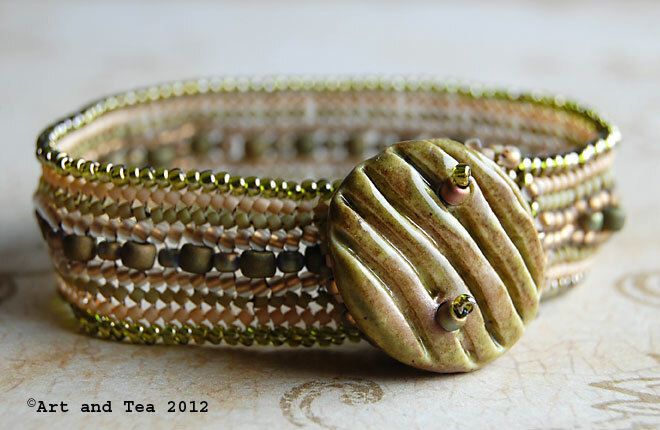 I used a matte metallic color, antique bronze AB, for the “scales” and the inside beads are a size 8 seed bead called “Green Tea”, one of my favorite colors and the name oh so appropriate for me. I purchased the beads at my LBS but I saw several online sources for them when I googled. 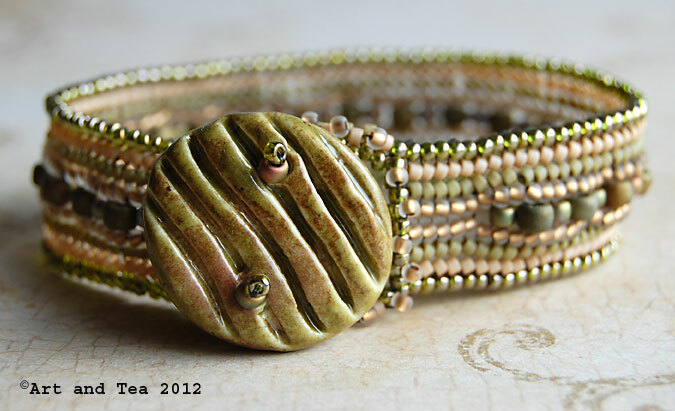 The bangle is created using brick stitch for the length and peyote stitch to zip up the strip into a tube shape. If you’re familiar with these bead stitches, it works up quite easily. The problem I ran into was in the sizing. I made it way too big for my wrist. 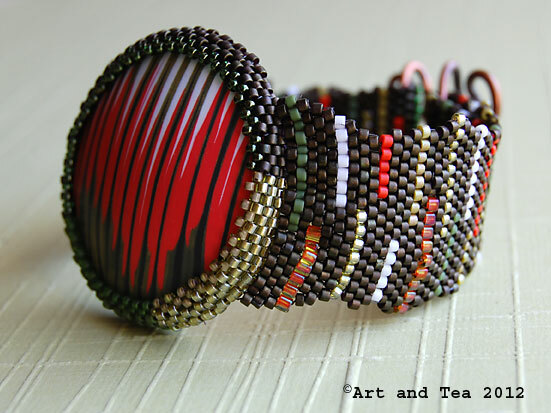 The challenge with a bangle like this is to make it big enough to fit over your hand yet not be too big for your wrist. I achieved the first challenge yet failed on the second. Oh well, now that the bangle is done, I wonder how I can make it smaller without it being a big production. Any ideas? The link I found for this issue indicated that they were all sold out of it but I bet if you contacted Nancy Jones directly, you might be able to purchase the pattern from her. As always, thanks for visiting and happy beadweaving!